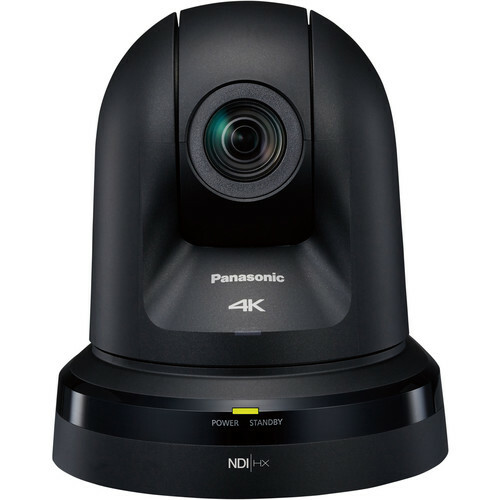 The black Panasonic 20x Zoom 4K PTZ Camera with 3G/HD/SD-SDI & HDMI Output and NDI Output 4K UHD, HD, and SD video over a variety of connections. It features a 1/2.3" 3MOS sensor and outputs over 3G/HD/SD-SDI, HDMI, or you can use the NDI protocol to stream video and audio, control (IP), tally, and power over a single Ethernet cable. When connected to the Internet, this IP camera allows you to control PTZ actions and monitor the surveillance area from a remote location via a Web browser. This provides you with several advantages like reduced integration costs, easy remote production and engineering, and lower cost for multiple location systems. 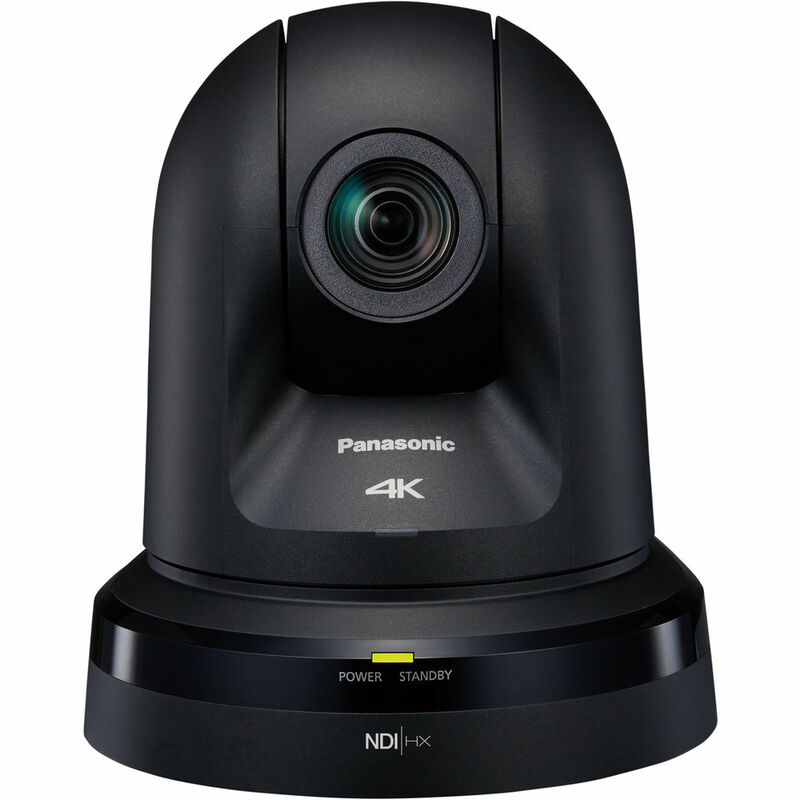 Equipped with a 20x optical zoom, 30x iZoom, and 12x digital zoom, this PTZ camera enables you to zoom in on activity in the monitoring area for a closer look. The Dynamic Range Stretch (DRS) minimizes blocked shadows and blown highlights. When it gets too dark to record normal footage, this Full HD PTZ camera uses Night Mode to capture clear images in monochrome. The camera supports audio input, allowing you to capture and embed audio within the video signal. It is PoE+ compatible, allowing you to power the unit using only the single LAN cable. NDI (Network Device Interface) goes beyond simply sending video over IP, and instead of just encoding video to travel along Ethernet cable, NDI also encodes control, tally, and PoE+. In addition to having to run fewer cables without needing to route power, video, and control to each camera location, now you can connect your camera to your network and have full control. NDI|HX brings automatic discovery, ultra-low latency video transmission, PTZ control and tally, all with a single Ethernet cable. Box Dimensions (LxWxH) 13.1 x 12.1 x 10.4"
How quiet is this unit when in operation? This is rated at NC35 or less, Noise Criterion. That is right within the recommended Noise Criterion levels for Houses of Worship, Conference Rooms and most of the other places a camera like this will tend to be used. The NDI standard includes 4K transmission over LAN. Can this camera do that or is it limited to 1080/60p over NDI and 4K only over HDMI? It is our understanding that the NDI standard is HD only. I am curious about the sensor in the AW-UN70 and how well it will work in low light? This camera has a fine in bright and medium light 1/2.3 Type MOS Sensor. It will struggle in low or near no light conditions. This camera is listed as 3MOS, but it's only a single chip, right? 3MOS is Panasonic for 3 sensors in one chip.